Non-traumatic osteonecrosis is a cause of joint pain and deformity, not uncommonly caused by corticosteroid use. Despite this, corticosteroid induced osteonecrosis is poorly represented in the literature. We performed a detailed review of corticosteroid induced osteonecrosis, including aetiology, prevention, screening, clinical presentation, investigations, staging systems and treatment. We present this in the context of a patient at our institution who developed bilateral hip, shoulder and knee osteonecrosis following high dose corticosteroid therapy for dermatomyositis. Non-traumatic osteonecrosis (NON), or avascular necrosis (AVN), is recognised as a cause of pain, loss of function and bone and joint deformity. The recognition of corticosteroids (CS) as a cause of NON is attributed to Pietrogoni in 1957 [1,2]. With increased steroid use and increasing awareness, it has become the second highest cause of osteonecrosis (ON)  behind traumatic ON. It is also implicated in multifocal osteonecrosis . Despite this, the literature regarding NON is generally poor. There is little literature regarding CS induced NON specifically or comparing different causes of NON; it is most often investigated with all causes of NON. Much of the literature on human subjects is dated and the methodology varied, making comparisons, extrapolations and recommendations difficult at best and it almost exclusively involves the femoral head, with recommendations for management of other sites extrapolated from these papers. There are a few studies regarding NON of the humeral head, however these are review articles and case reports. Interest in CS induced NON at our institution was stimulated by a patient who developed bilateral hip, shoulder and knee NON following high dose CS for dermatomyositis. We present a detailed literature review with this illustrative case. In 1995 a 43 year old man was diagnosed with dermatomyositis at a tertiary metropolitan hospital and commenced on a treatment protocol of oral steroids (Prednisolone 10 mg bd) and Azathiopine (150 mg daily). Initially poorly responsive to treatment, Azathiopine was ceased, the dose of Prednisolone was altered (maximum 45 mg in a day) and, at various times, Methotrexate (10 mg weekly), Cyclophosphamide (one gram weekly) and Dexamethasone (8 mg IV with Cyclophosphamide) were introduced. After ten months a treatment regime of oral Prednisolone 10 mg bd was adequate for maintenance purposes. In 2001, now aged 49, he was referred to our institution with debilitating, progressive pain and stiffness in both hips and shoulders. His hip symptoms manifest approximately eight months following the diagnosis of dermatomyositis and commencement of steroids, and progressed to his shoulders and knees. At the time of referral, his hip pain had forced his retirement from his job as a butcher and he required the use of walking aids. Both shoulders were painful and stiff, and his analgesic requirements were substantial. Plain radiology revealed Ficat stage four osteonecrosis of the femoral heads (Figure 1) and osteonecrosis of both humeral heads (Figure 2) and distal femora. Over a two year period he underwent bilateral hip replacement (Figure 3), bilateral shoulder hemiarthroplasty and a right total knee replacement without complication. He has symptomatic osteonecrosis of his left knee with arthritic changes requiring daily oral analgesia, and will require a total knee replacement in the near future. Figure 1. AP radiograph of the pelvis showing Ficat stage four osteonecrosis bilaterally. Figure 2. 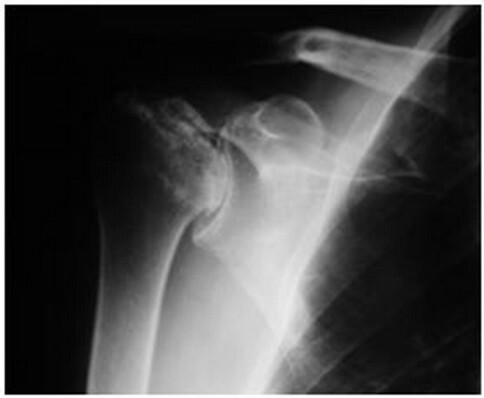 AP radiograph of the right shoulder showing osteonecrosis with collapse of the humeral head. cumulative Dexamethasone dose of 32 mg. This equates to a cumulative Prednisolone equivalent dose of 4.4 grams. His peak Prednisolone dose was 45 mg in one day and his average daily Prednisolone dose over the period was 18mg per day. Six months following commencement of steroid therapy he was diagnosed with difficult to control Hypercholesterolaemia. At that time his cholesterol was approximately 8 mmol/L; it is currently controlled with Atorvastatin therapy. Figure 3. AP radiograph of the pelvis showing bilateral total hip joint replacements. flow [4,5], bone marrow fat cell hypertrophy , hyperlipidaemia and fat embolism . There are a number of papers investigating the aetiology of CS induced NON in rabbit, mice and chicken models, but little human data. Given the multiple actions of CS, it is possible that multiple pathways combine to decrease blood flow in the osseous microcirculation leading to ON [8,9]. This “multi hit” theory helps to explain the inconsistency in development of NON between patients and probably includes genetic [9,10] as well as other predisposing factors. CS directly cause apoptosis of osteoblasts and osteocytes after prolonged exposure in vitro [8,9], and have been shown to suppress osteoblast and osteoclast precursor production in bone marrow in a mouse model . Bone progenitor cells preferentially differentiate into adipose cells when exposed to steroids in vitro [6,11], demonstrated by a decrease in alkaline phosphatase (ALP) concentration in vitro . Studies have shown CS induce not only increased numbers of bone marrow adipocytes, but also adipocyte hypertrophy . It has also been shown on magnetic resonance imaging (MRI) that a higher fatty marrow content of the femoral neck prior to CS treatment increases the risk of development of CS induced NON . The authors propose that the increase in amount of fat in the femoral neck increases pressure and thus decreases blood flow. It may be that the higher fatty marrow content of the femoral neck predisposes this region to NON over other bony sites. Bone blood flow in pigs has been shown to be reduced when exposed to CS  and femoral head blood flow and vascular endothelial growth factor protein are reduced in rabbits with CS induced NON [5,13]. CS may, through a complex pathway, also have direct effects on endothelial cells by modulating their responses to vasoactive substances and generally potentiating local hypertension and vasoconstriction [8,9]. One or all of these direct effects may be the cause of CS induced NON, and the exact mechanism may be different in different patients. Further, as osteonecrosis is not prevalent in CS excess from endogenous sources  such as adrenocorticotrophic hormone (ACTH) producing adenomas, some authors hypothesise that ACTH suppression and not CS excess per se is the causal feature . It is apparent that CS influence many physiologic pathways that theoreticcally may decrease osseous blood flow and potentiate NON. It is likely that the pathomechanism of CS induced NON is contributed to by a number of these pathways. Further research into the pathomechanism of CS induced NON in human subjects and the prevention of CS induced NON by targeting these pathways is warranted. A dose dependent risk of NON was suspected when the incidence in the renal transplant population decreased dramatically after development of non-steroidal immune modulators (eg. cyclosporine, tacrolimus) and the subsequent reduction in steroid dose, [2,15-17] however a number of studies failed to demonstrate this [14,16-19]. These often included low numbers of patients and dose relationship was not the primary outcome. In some studies different types of CS were compared, further confounding results. More recent studies have suggested an increased risk of steroid induced NON with increased cumulative CS dose [20-29], daily dose , peak CS dose and longer duration of treatment [21,30]. Specifically, a cumulative Prednisolone—equivalent dose of more than two  or three  grams has been implicated in ON . In a rabbit model, Motomura et al. demonstrated not only an increase in incidence of ON with increasing Methylprednisolone dose, but also a decrease in reparative tissue with increasing dose. While it is clear that CS dose influences the development of NON an exact dose dependant relationship or induction threshold has not been shown. Genetic susceptibility, [9,10] the type of CS, [23,31,32] method of delivery [23,27,28] and as yet unknown factors probably combine to alter the patient specific risk. It has been suggested that monitoring other functional effects of CS, such as increase in body mass index (BMI) [17,32] or development of Cushingoid features  may allow identification of increased risk for development of NON, however these are in themselves influenced by other factors. Further confounding research into dose related risk of CS is the finding that different corticosteroids may have different potencies to induce NON. While NON has been described with both Methylprednisolone and Prednisolone, one study using a rabbit model has shown Methylprednisolone to be more likely to induce NON than Prednisolone or Triamcinolone at equivalent doses . Also, bone reparative response was observed in cases of Prednisolone and Triamcinolone but not with Methylprednisolone . Niinimaki et al. and Bradbury et al. have shown a statistically significant correlation between higher cumulative Dexamethasone (a Methylprednisolone derivative) dose and NON, but not Prednisolone dose . Pulsed rather than continuous administration of steroids has been implicated in NON [23,27] although multiple confounding factors make this difficult to interpret. Parenteral or oral administration is much more likely to lead to NON than other routes of administration . Inhaled  and intramuscular  steroids inducing NON have been described but methodological flaws make these cases questionable [28,35]. Although the literature, particularly human literature, is limited it appears that a dose dependant relationship of CS induced NON does exist; it is reasonable to suggest that as low a dose of CS as clinically possible, monitoring of steroid related side effects and limited use of Methylprednisolone in favour of other CS may reduce the risk of NON. These are far from proven and require methodologically stringent human trials before they can be recommended with certainty. Patients receiving CS often have conditions that have themselves been implicated in causing NON including vasculitis or collagen synthesis disorders, such as systemic lupus erythematosus (SLE) [1,9,14,30,36,37]. Studies investigating the contribution of these disorders to NON are difficult as the treatment, high dose or long term CS, confound the conclusions. Patients with SLE and Raynaud’s phenomenon (a disorder of peripheral vasoconstriction) have been shown to be at higher risk of CS induced NON . ON following organ transplantation and subsequent long term CS use is well documented [16,38]; there may be a higher incidence of NON following renal transplantation. Studies typically quote 2% - 3% prevalence amongst cardiac transplant and 3% - 40% in a renal transplant group [23,28]. One hypothesis for this suggests co-existing renal disease may lead to osteoporosis and recurrent micro-fracture, possibly increasing the risk of NON . One study suggests an association between CS induced NON and inflammatory bowel disease . Recent interest in a possible vascular, coagulopathy  or lipid related [6,7] mechanism of CS induced NON has lead to investigations into possible pharmaceutical prevention. Most of the literature involves animal models or in vitro experiments, the few human studies are retrospective and methodologically poor. Some authors claim that statin therapy (lipid lowering agents), which is known to reduce the adverse effects of steroids on lipid metabolism , may reduce the risk of CS induced NON [40,41]. This has been demonstrated in a rabbit model [42,43] however a retrospective analysis of human renal transplant patients failed to demonstrate a protective benefit . Three articles investigating a rabbit model have found a statistically significant decrease in the rates of NON with a lipid-lowering agent and an anticoagulant compared with either agent alone and also to no prevention [45-47]. Interestingly, the average bone marrow fat cell size was lower in the lipid lowering agent groups [43,45,46]. Serum triglyceride level has been postulated as an independent risk factor for NON . Future research should correlate lipid lowering therapy with serum triglyceride levels when investigating NON prevention. Transdermal nitrate  and ACTH administration  have both been shown to be protective against NON in the rabbit model. It is clear that, at least in vitro, both lipid lowering agents and anticoagulants have some protective effect on the development of CS induced NON. Just as the pathophysiology of CS induced NON appears multifactorial, any effective prophylactic regime may require modification of multiple physiologic factors. The development of such a regime would represent a significant advance in the management of this patient population and therefore needs to be the focus of further well designed prospective human trials. The radiologic screening of patients for NON is debated. Given the benefits of early diagnosis and treatment, some authors recommend MRI screening for young patients receiving high dose CS [28,38,39], particularly if there is NON of another joint. This may be local [2,49] or whole body  investigation. The cost effectiveness of this has been questioned  as has the relevance of small asymptomatic lesions . Traditionally bone scintography has been used for whole body screening however whole body MRI (STIR sequence) has recently been described as a viable screening tool  and may offer greater sensitivity. Most of the literature describing the clinical presentation of NON refers to the femoral head and is related to all causes of NON. A careful medical and social history must be elicited, including a thorough investigation of risk factors including previous corticosteroid use [2,49, 51]. A high index of suspicion for NON must accompany a patient with a painful hip, normal x-rays and risk factors for NON, particularly AVN of the contralateral joint . Pain is the usual presenting complaint, commonly groin pain which may refer to the thigh or buttock [51-54] or knee . It is usually progressive and may be worse at night or exacerbated by coughing , movement or weight bearing [54,56]. It has been described as a throbbing and deep pain [51,55], of gradual [51,52] or sudden [53,56] onset. On examination, there is usually a painful range of motion, [52,55] especially on forced internal rotation, [51,53,55] and range may be decreased [53,57-59]. A limp or decreased function may be present in later stages. Examination of the contralateral hip, regardless of symptoms, is recommended due to the high incidence of bilateral disease . There have been recent reports of NON of the shoulder, describing poorly localised shoulder pain [2,49,60] which is exacerbated by use  and particularly overhead activities [49,60]. The pain is usually intermittent, of a deep, throbbing character and may radiate to the elbow . It often (70%) interferes with sleep and (80%) with work [2,49]. It may be associated with a painful click [2,49,57,59] in later stages. On examination of the shoulder there may be local tenderness [2,49], with decreased active and passive range of motion [2,49]. Abduction to 60 degrees and forward flexion to 90 degrees, which brings the commonly involved superiomedial head  into contact with the glenoid, may produce pain . Investigations include radiology and histology. The majority of literature regarding investigations into NON is decades old with the exception of articles regarding MRI, which has markedly altered early diagnosis. Historically Ficat described “every case of AVN goes through a pre (plain) radiologic stage” . In order to diagnose these lesions he developed the “study of the haemodynamics of the medullary circulation,” which he termed “the functional exploration of bone” . This included measurement of bone marrow pressure and oxygen saturation, intraosseous venography and core biopsy of the femoral head. The biopsy sample was examined histologically and, as an unexpected coincidence, formed the basis of the core decompression treatment modality . Histology of early lesions showed abnormalities of the bone marrow [1,55,58] showing stasis, fibrosis and necrosis . Oedema and haemorrhage may occur  as may atrophy of lipocytes  and loss of cellular detail . Later the classic histology is empty lacunae with loss of osteocytes [51,55,56,58]. Bony architecture is preserved and lipocytes may remain . Adjacent to the sequestrum may be a fibrovascular proliferation demonstrating the zone of repair [1,56]. Later the marrow may be resorbed and replaced by proliferating haemopoetic tissue, with osteoblast and osteoclast function [55,58]. These tests were shown to be useful in early diagnosis [1,51,53] but have been replaced by non-invasive methods. The mainstay of investigation remains the plain radiograph. AP and frogleg lateral radiographs should be obtained of the hip [51,55], and AP, axillary lateral, internal rotation and external rotation images of the shoulder [2,49,60]. A cross table lateral hip x-ray will not show subtle bony architecture of the femoral head well . AVN can be diagnosed by a finding of triangular shaped sclerosis , crescent sign, subchondral fracture and collapse or a combination of the above. Differential diagnosis would include bone infarct, cyst, benign and malignnant tumours or infection, which should be excluded . Early AVN is undetectable on plain imaging [36,53]; the radiologic changes are not of the necrotic bone itself, which has identical radiographic appearance to living bone , but the reactive bone changes around it. Bone scintography, typically with technetium 99 methylene-diphsophonate, may show AVN with areas of increased uptake (reactive bone) [49,51,53,55] possibly surrounding an area of decreased uptake (necrotic zone) [1,49,53,55]. It is not specific for AVN [1,51,53] and is less sensitive than MRI [1,60]. There may be no changes in the first two weeks . It has the advantage of screening the whole body easily and relatively cheaply. Computed tomography (CT) scanning is not widely used . It provides better imaging of the anterior femoral head (often involved in AVN), evaluation of the size of the sequestrum  and detection of early collapse  than plain radiographs but has largely been superseded by MRI. MRI is the most sensitive form of imaging to detect AVN [51,60], 80% to 100% sensitive in femoral head1 , and approaching 100% in shoulder AVN [2,49]. Specificity for MRI is also very high  with a characteristic appearance of a ring of low intensity signal on T1 images, indicating fat cell necrosis, and a double ring on T2 images, possibly the zone of vascular proliferation [1,51,55]. This double line is present in over 50% [2,49] to 80% [55,61] of cases. Changes may not be present until five days after onset of the disease . MRI appearance of proximal humeral AVN is similar to that in the femoral head . Early and accurate diagnosis of NON is imperative. A high index of suspicion should accompany a previous history of high dose or prolonged steroid use, NON of other joints and a young patient presenting with a painful joint and unremarkable plain radiographs. Examination may reveal pain on range of motion only, particularly forced IR of the hip. A full series of plain radiographs are likely to provide the diagnosis; if they are unremarkable an MRI scan should be obtained as symptoms predate plain radiology by several months [36,53] and early diagnosis and treatment affords the best outcomes [51,55]. A number of different staging systems have been described for the femoral head, and one for the humeral head [2,49,51,60]. They are based on a combination of plain radiographs, MRI and clinical data. Ficat and Arlet described the first staging system based on plain radiographs . This was modified in 1979 by Hungerford who included a pre clinical, pre plain radiological stage 0, the so called “silent hip”, with only MRI changes. Stage 1 is characterised by hip pain but normal x-rays; in stage 2 there is radiographic evidence of bone repair; areas of lysis (cysts), osteoporosis or sclerosis. There is a transition phase between stage 2 and 3 with x-rays showing the cresent line (subchondral fracture) and segmental flattening of the femoral head, the so called “out of round” appearance. Stage 3 shows a sequestrum which later goes on to collapse of the femoral head, however the joint space is preserved, and stage 4 involves loss of articular cartilage of the femoral head and acetabular osteophytes. Ficat described this as the appearance of osteoarthritis superimposed on a deformed femoral head . Pre collapse (stage 0 - 2) has a better prognosis than post collapse (stage 3 and 4) [51,53]. Steinberg  staged the lesion according to size; less than 15% of the femoral head, 15% - 30% or greater than 30%. Smaller lesions may have a better prognosis [63,64]. Kerboull  described the cumulative necrotic angle, which is the combined measurement of the arc of necrosis (as an angle) on the AP and lateral x-rays. A cumulative necrotic angle of 200 degrees has been shown to have a poor outcome . Ohzono  stratified NON by the location of the lesion on an AP hip x-ray into the medial third, medial and central two thirds and including the lateral third. Prognosis is worse with more lateral disease [51,63,66]. The Association Research Circulation Osseous (Toulouse, France)  described a staging system that combines the Ficat and Arlet radiographic system with the sizing component of Steinberg and the location described by Ohzono . Cruess modified the Ficat and Arlet staging system for use in humeral head AVN [2,49,59,60]. Stage 1 is pre radiologic, stage 2 shows sclerosis, stage 3 demonstrates a crescent sign, in stage 4 there is collapse of the humeral head and in stage 5 there is glenoid involvement as well. La Porte  and Sakai  have both used variations of the Kerboull angle in the shoulder, with collapse likely if the combined necrotic angle is greater than 90 degrees . The natural history of CS induced NON and NON from all causes remains largely undefined. There is no specific information regarding CS induced NON in the English literature. The literature in general is inconclusive, with confounding factors including the method and stage of diagnosis and length of follow up. Historically, symptomatic ON of the femoral head from all causes has been investigated with non operative management; in 1995 Mont and Hungerford  found 819 cases in the literature. Of these, only 22% went on to have a satisfactory outcome at an average of 34 months. They found that 33% of pre collapse (stage 1 and 2) hips were preserved however only 13% of stage 3 hips escaped arthroplasty . Other investigators have shown that 85% of untreated symptomatic stage 1 and 2 disease hips progress to collapse (stage 3 or 4) within 2 years [51,69]. Two recent studies have commented on the natural history of small asymptomatic femoral head NON, with conflicting results. Nam et al. showed that asymptomatic lesions involving less than 30% of the femoral head remain pain-free for more than 5 years, where as Hernigou et al. found that 73% of very small (<10% of the femoral head) lesions collapsed and developed pain within 12 years. Other authors profess that 67% of asymptomatic hips progress to collapse . The use of MRI to detect asymptomatic hips remains a point of contention as to their clinical relevance [38,70]. It remains contentious whether NON lesions can repair and revascularise to normal bone. Early revascularisation has been shown experimentally in animal models [31, 71,72] and MRI studies in humans suggests early spontaneous incomplete [70,73] and even complete  regression is possible but low numbers and poor methodology prohibit definite conclusions. The onset of MRI changes in NON is unknown; they have been shown five days post CS insult in animal models . Nevertheless, most cases of CS induced NON are present on MRI within three  or nine  months of beginning treatment. It is uncertain whether continuing steroid use affects the progression of NON with divided recommendations in the literature [26,70]. Early reparative tissue has been described in rabbit models with lower doses of CS compared to no reparative response with high doses [13, 26]. Slower clinical progression may be seen with humeral head NON [49,59]. The true natural history of NON remains unknown. Progression from necrosis through sclerosis to collapse is likely although revascularisation and repair appear possible in some cases. Further research into the progression of MRI detected asymptomatic lesions is necessary to determine their significance and the true natural history of NON. The literature focusing on treatment of NON does not investigate CS induced NON specifically. The few authors who attempt to stratify treatment outcomes according to causes of NON suffer from small numbers and multiple confounding factors and have contradictory results [1,49,51]. A vast number of treatments have been described and are broadly categorised into joint preserveing or joint replacing (arthroplasty) treatments. Treatment options are according to stage of disease [2,51,56], particularly pre collapse or post collapse. Pre collapse treatment is the most debated. The literature is almost exclusively focused on the treatment of femoral head NON, although limited literature on humeral head NON suggests that it may have a better prognosis [49,56,60], perhaps as it is a non weight-bearing joint. We will discuss the treatment of femoral head NON initially. Non-operative management, including bed rest, nonweight bearing, partial weight bearing and traction appears to have the same progression as the natural history of NON [1,51,65] in the hip, the specifics of which are unknown but 85% of symptomatic pre-collapse hips progress to collapse within 2 years [51,69]. Historically, only 22% of hips treated non-operatively have a satisfactory clinical outcome, with radiologic progression in 74% of patients and 76% of patients going on to arthroplasty . Failure rates increased with stage of disease . Pharmacologic treatments aim to alleviate pathophysiologic features while allowing revascularisation and new bone growth . Many have been described, targeting a specific aspect of a hypothesised cause. The literature is severely limited by small numbers and confounding factors. Vasodilators and anti-hypertensives have been shown to decrease bone marrow pressure and hip pain respectively in very low numbers . Lipid lowering agents, prostacyclin analogues, anticoagulants and fibrinolytics have also been trialled [55,60]. Bisphosphonates have been shown to be beneficial in two studies [75,76] and poor in one . Treatment was more successful in early (pre collapse) disease [75,77]. Core decompression for ON of the femoral head is controversial  with varying results in the literature. It remains most commonly practised in North America . Ficat first reported on more than 600 cases of core decompression for all causes of ON, 156 patients with stage one or two disease, with over five year follow up. He reported 93.9% stage 1 and 82.3% stage 2 good results. No radiographic progression was found in 86.6% of stage 1 and 66.7% of stage 2 hips . These results have not been achieved by all investigators. In a 1995 literature review Mont and Hungerford  found 24 reports comprising 1206 hips with combined results of 64% clinical success, 63% had no radiographic progresssion and 33% progressed to THJR or other operative intervention. Better results were again found in early stage disease . There were only two prospective controlled trials, with combined results of 75% clinical success in pre collapse hips, compared to 29% from nonoperative management, and 61% radiologic success compared to 39% with non-operative management . Arlet reports radiologic stability in 85% of pre collapse hips at mean seven years . Core decompression associated with autologous bone marrow aspirate transplantation has been described  with good short term results, and greater vascularisation has been shown with this treatment in the rabbit model  when compared to no treatment or core decompresssion alone. Non vascularised bone graft includes cortical and non cortical grafts. Surgical techniques vary considerably with low numbers reported in the literature. Results appear similar to core decompression . Many different vascularised grafts have been reported with considerable variation in indications, techniques and results, with 67%  to 93%  good results reported over 3 to 10 years. Critics report considerable donor site morbidity [78,79], problems with maintaining graft patency, considerable technical difficulty and long surgical times . Better results have been described with pre collapse stages [78,80], smaller areas of necrosis [78,79], medial lesions  and younger patient age (<35) . Overall, superiority of vascularised grafts has not been proven and morbidity is high . Multiple proximal femoral osteotomies have been described including varus, valgus, rotational and combinations of the above. The aim is to move the necrotic segment away from the major load transmitting area [51,65]. Again, success rates in the literature are variable, with reports from 55% to 89% for stage 2 and 3 disease [51, 65,81,82]. Better results were found with a combined necrotic angle of less than 200 degrees [51,65,81] and if the intact area of the head is >30% [1,82]. Worse results have been described with CS induced NON compared with other causes [51,81]. Critics of osteotomy to treat NON describe the technical difficulty , long recovery and high patient compliance required . It is more difficult to perform a THJR than in a non osteotomised femur [51,55], and a poor rate of return to work (<50%) has been described . THJR (total hip arthroplasty) is reserved for severe stage three and stage four disease. Hemiarthroplasty and femoral head resurfacing have been advocated in the past but have inferior results due to rapid accetabular degeneration . Inferior results for THJR performed for NON have been reported compared to THJR performed for osteoarthritis [1,54,83], though recent results appear similar (6% revision rate at 2 - 10 years) . Hip arthrodesis has been reported but due to high (50% - 80%) bilateral involvement, is not recommended [18,56]. The literature regarding treatment of femoral head CS induced NON in general is plagued with low numbers of patients, poor methodology and short follow up. Variable techniques, inclusion criteria and diagnostic methods make comparisons difficult and conclusions unsure. Non operative management is unlikely to prevent progression, the exception to this may be pharmaceutical agents which are promising although grossly under investigated to allow any conclusions. Core decompression may be effective in delaying the need for total hip joint replacement in stage 1 and 2 disease; it should not be considered for post collapse lesions . It may be as efficacious as bone grafting. Osteotomy may be appropriate for certain lesions, although the technical difficulties and improvements in THJR make arthroplasty appealing. It is likely that newer techniques and better perioperative management have improved results of THJR for NON. Arthrodesis is relatively contraindicated in NON. Trends would suggest that early, pre collapse treatment is likely to achieve better results, as are smaller, medial lesions, regardless of treatment modality. Patients with CS induced NON may do worse than other causes of NON, as may SLE patients, however these relationships are far from certain. There is very limited literature focusing on the treatment of humeral head NON, primarily small case series and review articles, again not specific to CS induced NON. In contrast to femoral head NON, non operative treatment may be used in early (stage one and two) disease of the shoulder, including maintenance of range of movement and limiting over head activities [2,49]. Nonoperative management of stage 3 disease has poor results . Arthroscopy, debridement and removal of loose bodies for humeral head NON has been reported to increase function and decrease pain in the short term [2,60], but very low numbers may confound these results . Core decompression has been used in proximal humeral NON and has been shown to improve pain and delay or avoid arthroplasty in pre collapse shoulders [2,49,60]. Combined with arthroscopy it has theoretical advantages but low representation in the literature precludes conclusions . Vascularised graft has been used in the humeral head, however there is not enough evidence to recommend it over arthroplasty for stage 3 and 4 disease . Humeral head hemiarthroplasty has good to excellent results in low numbers of reports for stage four disease , however results may deteriorate with time due to glenoid erosion . Humeral head resurfacing has some anecdotal evidence but minimal representation in the literature . Total shoulder arthroplasty is reserved for grade five (glenoid involvement) disease and has been shown to improve pain and function  in limited numbers. Although sparsely investigated in the literature multiple authors have concluded the humeral head NON has a better prognosis than that of femoral head NON, particularly in the setting of continued steroid use. One may postulate that because the shoulder transmits less weight than the hip the time to collapse and loss of structural integrity is longer. It is difficult to draw any firm conclusions from the current literature, however it appears that treatment algorithms will be similar to that of femoral head NON, with the possible addition of arthroscopic evaluation and debridement in the shoulder. Literature on the treatment of NON affecting other areas is limited to case series and case reports. Osteochondral autograft transplantation for CS induced NON of the elbow  and femoral condyle  has been described, as has osteochondral allograft , autologous chondrocyte transplantation (ACI)  and synthetic structural graft  of the femoral condyles, with generally good results at short follow-up. The available literature does not allow solid conclusions. We present a thorough review of the English literature and an illustrative case report of corticosteroid induced osteonecrosis. Whilst it is difficult to make firm recommendations due to the heterogeneity of the literature a number of trends are apparent. It appears that there is, albeit undefined, a dose dependant relationship and probably a preparation dependant relationship to corticosteroid induced osteonecrosis. This may be markedly different between patients and may have a genetic component. If steroid therapy is to be commenced, we recommend that the lowest possible dose be used for the shortest possible duration and that oral preparations, such as prednisolone, are used in place of parenteral preparations where possible. It seems appropriate to assess the functional effect of steroid treatment such as change in body mass or serum triglyceride levels to assess a patient’s risk of developing osteonecrosis. We are unable to recommend a preventative regimen. All patients being commenced on a corticosteroid should be educated regarding the risk of nontraumatic osteonecrosis, the early clinical symptoms and the benefits of early diagnosis. We recommend regular follow up with clinical examination and aggressive investigation to achieve early diagnosis. Investigations should include plain radiographs and, if required for diagnosis, MRI. If nontraumatic osteonecrosis is diagnosed imaging of other at risk joints (such as the contralateral hip) should be performed. The routine radiographic screening of high risk patients remains controversial due to the uncertain significance of early MRI findings of and the unproven treatment benefits of asymptomatic lesions and therefore cannot be recommended. We recommend core decompression for Ficat stage one or two osteonecrosis of the femoral head; the addition of bone graft is of unproven benefit. For late stage disease we recommend total hip arthroplasty in appropriate patients. Osteotomy may be appropriate for certain lesions or patients although the technical difficulties and improvements in total hip arthroplasty make this less appealing. Arthrodesis remains relatively contraindicated in NON. Due to the low representation in the literature it is not possible to make any evidence based conclusions regarding the treatment of corticosteroid induced osteonecrosis of other areas, however the basic principles of management still apply. It seems reasonable to perform joint preserving operations for pre collapse lesions and joint replacement or arthrodesis procedures for post collapse lesions as appropriate to the involved area. The clinical investigation of osteonecrosis, particularly non-traumatic osteonecrosis, is made difficult by the low incidence in the general population, late onset of clinical symptoms, concurrent medical comorbidities and the uncertain significance of early radiologic findings. Despite this, good quality future investigations need to focus on the early treatment of corticosteroid induced osteonecrosis, particularly the pharmacologic treatment and core decompression. The recent investigation of corticosteroid induced osteonecrosis is largely in vitro experiments focusing on pathophysiology with interesting yet inconclusive results. More effort needs to be focused in this area and that of pharmacologic prevention. The intriguing possibility of spontaneous healing of osteonecrotic lesions also warrants further exploration. The authors would like to acknowledge Mr. Craig Donohue for his contribution to the case report. Arlet, J. (1992) Nontraumatic avascular necrosis of the femoral head past, present, and future. Clinical Orthopaedics and Related Research, 277, 12-21. LaPorte, D.M., Mont, M.A., Mohan, V., Jones, L.C. and Hungerford, D.S. (1998) Multifocal osteonecrosis. The Journal of Rheumatology, 25, 1968-1974. Wang, G., Zhang, C.Q., Sun, Y., Feng, Y., Chen, S.B., Cheng, X.G. and Zeng, B.F. (2010) Changes in the femoral head blood supply and vascular endothelial growth factor in rabbits with steroid-induced osteonecrosis. The Journal of International Medical Research, 38, 1060- 1069. Cui, Q., Wang, G.J. and Balian, G. (1997) Steroid-induced adipogenesis in a pluripotential cell line from bone marrow. The Journal of Bone & Joint Surgery, 79-A, 1054- 1063. Jones, J.P. (1993) Fat embolism, intravascular coagulation, and osteonecrosis. Clinical Orthopaedics and Related Research, 292, 294-308. Li, Y., Yue-Bai, L. and Yi-Sheng, W. (2006) Dexamethasone-induced adipogenesis in primary marrow stromal cell cultures, mechanism of steroid-induced osteonecrosis. Chinese Medical Journal, 119, 581-588. Colwell, C.W. Jr., Robinson, C.A., Stevenson, D.D., Vint, V.C. and Morris, B.A. (1996) Osteonecrosis of the femoral head in patients with inflammatory arthritis or asthma receiving corticosteroid therapy. Orthopedics, 19, 941- 946. Cruess, R.L., Blennerhassett, J., Macdonald, F., Maclean, L.D. and Dossetor, J. (1968) Aseptic necrosis following renal transplantation. The Journal of Bone & Joint Surgery, 50-A, 1577-1590. Zhang, N.F., Li, Z.R., Wei, H.Y., Liu, Z.H. and Hernigou, P. (2008) Steroid-induced osteonecrosis the number of lesions is related to the dosage. The Journal of Bone & Joint Surgery, 90, 1239-1243. Bradbury, G., Benjamin, J., Thompson, J., Kiees, E. and Copeland, J. (1994) Avascular necrosis of bone after cardiac transplantation prevalence and relationship to administration and dosage or steroids. The Journal of Bone & Joint Surgery, 76-A, 1385-1388. Saisu, T., Sakamoto, K., Yamada, K., Kashiwabara, H., Yokoyama, T., Lida, S., et al. (1996) High incidence of osteonecrosis of femoral head in patients receiving more than 2 g of intravenous methylprednisolone after renal transplantation. Transplantation Proceedings, 28, 1559- 1560. Karkoulias, K., Charokopos, N., Kaparianos, A., Sampsonas, F., Tsiamita, M. and Spiropoulos, K. (2007) Aseptic femoral head necrosis in a patient receiving long term courses of inhaled and intranasal corticosteroids. Tüberküloz ve Toraks Dergisi, 55, 182-185. Kelman, G.J., Williams, G.W., Colwell, C.W. Jr. and Walker. R.H. (1990) Steroid-related osteonecrosis of the knee two case reports and a literature review. Clinical Orthopaedics and Related Research, 257, 171-176. Marston, S.B., Gillingham, K., Bailey, R.F. and Cheng, E.Y. (2002) Osteonecrosis of the femoral head after solid organ transplantation: A prospective study. The Journal of Bone & Joint Surgery, 84-A, 2145-2151. Vakil, N. and Sparberg, M. (1989) Steroid-related osteonecrosis in inflammatory bowel disease. Gastroenterology, 96, 62-67. Mont, M.A. and Hungerford, D. (1995) Current concepts review non-traumatic avascular necrosis of the femoral head. The Journal of Bone & Joint Surgery, 77-A, 459- 474. Cruess, R.L. (1978) Experience with steroid-induced avascular necrosis of the shoulder and etiologic considerations regarding csteonecrosis of the hip. Clinical Orthopaedics and Related Research, 130, 86-93. Ficat, R.P. (1985) Idiopathic bone necrosis of the femoral head early diagnosis and treatment. The Journal of Bone & Joint Surgery, 67-B, 3-9. Lavernia, C.J., Sierra, R.J. and Grieco, F.R. (1999) Osteonecrosis of the femoral head. Journal of the American Academy of Orthopaedic Surgeons, 7, 250-261. D’Aubigne, R.M., Postel, M., Mazabraud, A., Massias, P. and Gueguen, J. (1965) Idiopathic necrosis of the femoral head in adults. The Journal of Bone & Joint Surgery, 47B, 612-633. Cruess, R.L. (1976) Steroid-induced avascular necrosis of the head of the humerus natural history and management The Journal of Bone & Joint Surgery, 58-B, 313-317. Cruess, R.L. (1998) Osteonecrosis of bone current concepts as to etiology and pathogenesis. Clinical Orthopaedics and Related Research, 208, 30-39. Cruess, R.L. (1985) Corticosteroid-induced osteonecrosis of the humeral head. Orthopedic Clinics of North America, 16, 789-796. Harreld, K.L., Marker, D.R., Wiesler, E.R., Shafiq, B. and Mont, M.A. (2009) Osteonecrosis of the humeral head. Journal of the American Academy of Orthopaedic Surgeons, l 17, 345-355. Mitchell, D.G., Rao, V.M., Dalinka, M.K., Spritzer, C.E., Alavi, A., Steinberg, M.E., et al. (1987) Femoral head avascular necrosis, correlation of MR imaging, radiographic staging, radionuclide imaging, and clinical findings. Radiology, 162, 709-715. Steinberg, M.E., Hayken, G.D. and Steinberg, D.R. (1995) A quantitative system for staging avascular necrosis The Journal of Bone & Joint Surgery, 77-B, 34-41. Hernigou, P., Poignard, A., Nogier, A. and Manicom, O. (2004) Fate of very small asymptomatic stage-1 osteonecrotic lesions of the hip. The Journal of Bone & Joint Surgery, 86-A, 2589-2593. Kerboul, M., Thomine, J., Postel, M. and D’Aubigene, R.M. (1974) The conservative surgical treatment of idiopathic aspetic necrosis of the femoral head. The Journal of Bone & Joint Surgery, 56B, 291-296. 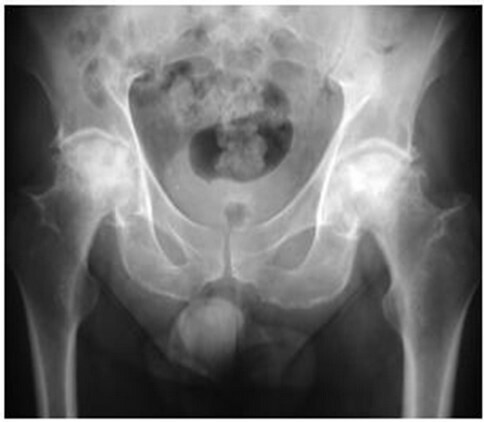 Ohzono, K., Saito, M., Sugano, N., Takaoka, K. and Ono, K. (1992) The fate of nontraumatic avascular necrosis of the femoral head a radiologic classification to formulate prognosis. Clinical Orthopaedics and Related Research, 277, 73-78. ARCO (Association Research Circulation Osseous) (1992) Committee on terminology and classification. ARCO News, 4, 41-46. Urbaniak, J.R. and Harvey, E.J. (1998) Revascularization of the femoral head in osteonecrosis. Journal of the American Academy of Orthopaedic Surgeons, 6, 44-54. Takano-Murakami, R., Tokunaga, K., Kondo, N., Ito, T., Kitahara, H., Ito, M. and Endo, N. (2009) Glucocorticoid inhibits bone regeneration after osteonecrosis of the femoral head in aged female rats. The Journal of Experimental Medicine, 217, 51-58. Cheng, E., Thongtrangan, I., Laoor, A. and Saleh, K.J. (2004) Spontaneous resolution of osteonecrosis of the femoral head. The Journal of Bone & Joint Surgery, 86-A, 2594-2599. Agarwala, S., Shah, S. and Joshi, V.R. (2009) The use of alendronate in the treatment of avascular necrosis of the femoral head follow-up to eight years. The Journal of Bone & Joint Surgery, 91-B, 1013-1018. Kotecha, R.S., Powers, N., Lee, S.J., Murray, K.J., Carter, T. and Cole, C. (2010) Use of bisphosphonates for the treatment of osteonecrosis as a complication of therapy for childhood acute lymphoblastic leukaemia (ALL). Pediatric Blood & Cancer, 54, 934-940. Yoo, M., Kim, K., Hahn, C. and Parvizi, J. (2008) Long-term follow up of vascularized fibular grafting for femoral head necrosis. Clinical Orthopaedics and Related Research, 466, 1133-1140. Ugiokam, Y., Otokebuchmi, T. and Sutsuim, H. (1992) Transtrochanteric anterior rotational osteotomy for idiopathic and steroid-induced necrosis of the femoral head indications and long-term results. Clinical Orthopaedics and Related Research, 277, 111-120. Garino, J.P. and Steinberg, M.E. 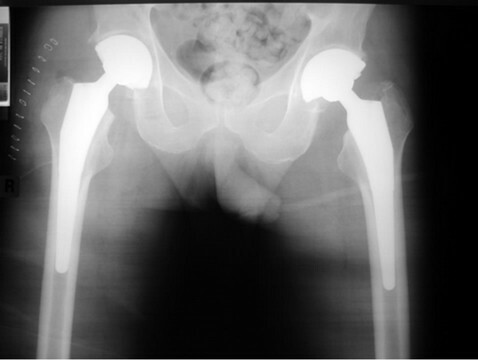 (1997) Total hip arthroplasty in patients with avascular necrosis of the femoral head a 2 to 10 year follow up. Clinical Orthopaedics and Related Research, 334, 108-115. Watanabe, R., Sato, K., Nakamura, T., Obara, Y., Toyama, Y. and Ikegami, H. (2011) Steroid-induced osteonecrosis of bilateral distal humerus treated by arthroplasty using costal osteochondral graft: Case report. John Hornby Skewes, 36A, 816-819. Gortz, S., De Young, A.J. and Bugbee, W.D. (2010) Fresh osteochondral allografting for steroid-associated osteonecrosis of the femoral condyles. Clinical Orthopaedics and Related Research, 468, 125-146. Adachi, N., Ochi, M., Deie, M., Ishikawa, M. and Ito, Y. (2007) Osteonecrosis of the knee treated with a tissueengineered cartilage and bone implant. The Journal of Bone & Joint Surgery, 89, 2757-2757.